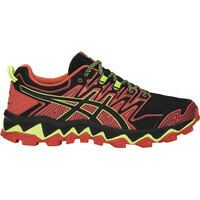 You might be needing trail running shoes. It’s always best to come into one of our stores to get a proper shoe fitting so we can make sure you end up with a suitable shoe for your foot strike and foot shape. No amount of internet research compares to the experience of going into a specialist and trying on a variety of different options and jogging up and down outside in them. 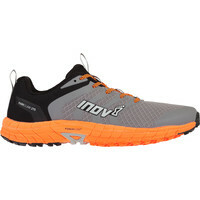 Here is a small selection of popular trail shoes from the Run and Become range this season. 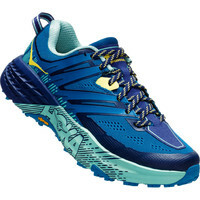 With Hoka’s trademark maximal cushioning, the Speedgoat provides cushy shock absorption for long and ultra-distance trail running. 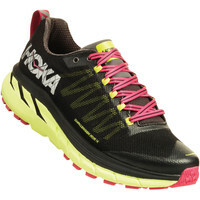 Hoka’s “bucket seat” design means your foot sits lower in the midsole than you’d expect which makes it more stable than it looks. A hard-wearing Vibram Megagrip outsole with 5mm lugs helps keep your footing secure when the terrain is treacherous. Built on a 4.5mm offset so you’re on an even platform as you tackle the trails. 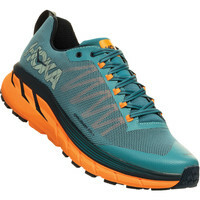 Mega-cushioned like all Hoka shoes the Challenger is a door to trail running shoe with 4mm lugs for on and offroading. 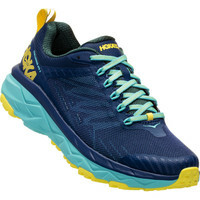 Hoka’s early stage meta rocker rolls you through the stride and the midsole is thick enough that you don’t feel sharp rocks poking through. 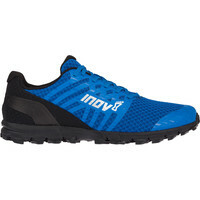 Inov-8 specialize in light, agile, low profile trail runners – perfect for hopping over all kinds of non-road terrain. ParkClaw 275 is their solution for situations where you need a bit more shock absorption – mixed terrain running when your runs carry you over roads, parks, paths and trails. A Powerflow+ midsole provides cushioning and bounce – giving you back the energy you put in – and the tread is specifically designed to grip on the sloppy stuff but feel smooth on firmer ground or roads. 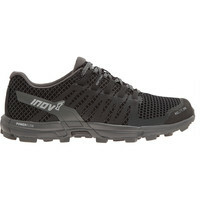 It's wider in the toe box than many other Inov8s as well to allow for swelling on long runs or in hot conditions. 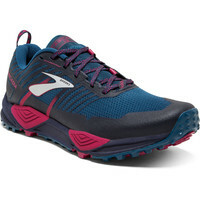 Dubbed by Brooks an “SUV for your feet”, the Cascadia packs plenty of grip and its four pivot points – one on each side of the heel and forefoot, where the wheels would be if your foot was a car – serve to balance the foot on uneven terrain and provide an amount of pronation control if you’re running on firmer ground for any length of time. 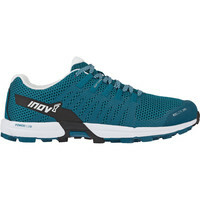 Good cushioning and a “water in, water out” upper which drains easily after getting wet make this a favourite for multi-surface running. A rock stop plate protects the foot from sharp rocks. 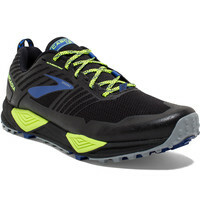 A support system on the inside holds the arches upright and prevents overpronation. A deeply lugged sticky rubber outsole grips the ground when it's wet or dry. 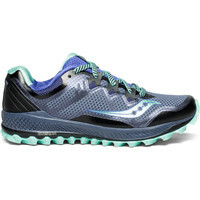 Flytefoam and Gel absorb shock when you're running over hard surfaces and a rock-stop plate protects the soles of your feet from sharp stones. Designed for all types of terrain – rock, mud, grass and hard packed trail, the Roclite is a really stripped back trail runner to offer you a truly “connected to your run” experience. 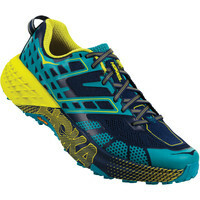 Multi-directional claw-shaped cleats are designed to bite into soft ground and release mud easily so they don’t get clogged up. 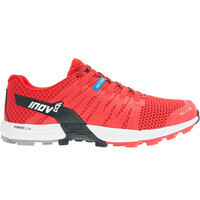 A 4mm drop and a thin Powerflow midsole protects the foot without compromising ground feel. A rock plate shields the foot from pointy stones. 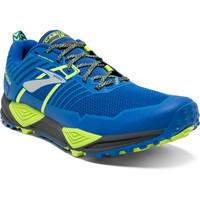 Roclite 290 G-grip has the hardest wearing graphene outsole. 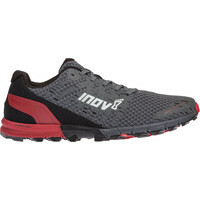 Built on Inov8’s ‘standard’ last, the TrailTalon comes up wider than the Roclite and will better accommodate a broad foot. 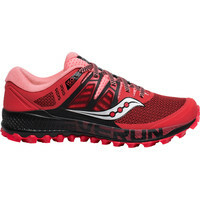 The tread is designed for hard packed trails with multi-directional 4mm lugs - each having a wide contact area to give you grip on softer terrain whilst also providing traction on harder terrain. A toe bumper at the front protects the toes and an external heel cage wraps the heel for additional stability when the ground is uneven. A gusseted tongue stops debris getting in. 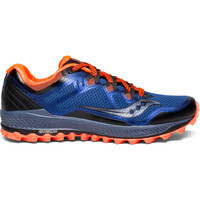 This is Saucony's luxurious trail shoe, thanks to the full length EVERUN cushioning and extraordinary multidirectional 6mm deep grip. 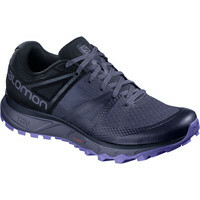 The 4mm heel drop will keep you close to the ground, and keep the shoe stable on any road or trail surface. 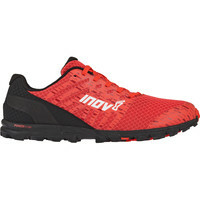 An ISOFIT upper and a soft inner sleeve offer protection against any debris you come across, and provide a luxuriously comfortable ride. 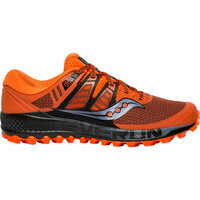 Peregine is a minimal, multi surface trail running shoe or what Saucony call a “run anywhere” shoe. 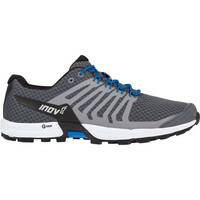 A 4mm drop midsole with super bouncy Everun cushioning gives you an energized feeling and a 6mm lugged sticky outsole gives you the security to run nimbly over your chosen terrain. 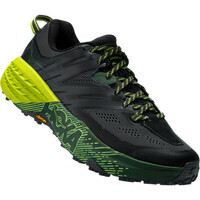 A trail specific upper protects the foot from trail hazards. 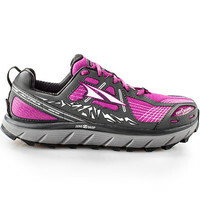 Like all Altra shoes, the Lone Peak has a spacious, rounded, 'footshaped' toebox which encourages toe splay and a zero drop platform which keeps you on a level footing. 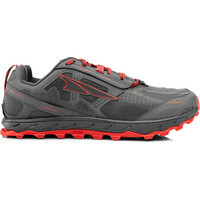 A sticky rubber outsole with a TrailClaw lug pattern gives grip in boggy, wet conditions. Lugs are positioned directly beneath the metatarsals so they dig into the earth as if they were an extension of your feet. A rock plate protects the foot from sharp stones. 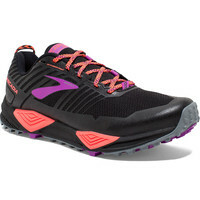 All the cushioning, sticky gripiness and stabilizing qualities of the regular Cascadia (see above) but with a breathable and flexible GoreFlex upper that keeps out the wet without the crinkly crunchiness normally associated with Goretex running shoes. 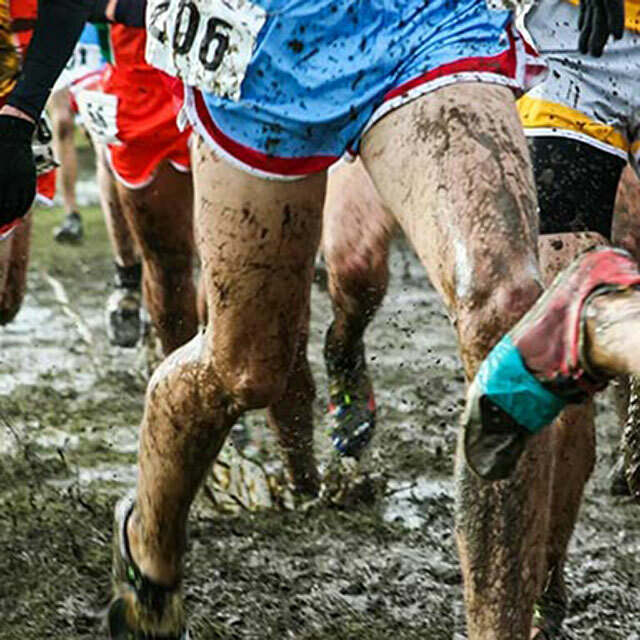 A rubber mud guard, applied with a 3D printer, skirts the lower part of the upper to protect your foot from debris and a rock plate prevents sharp rocks from bruising the soles of your feet. 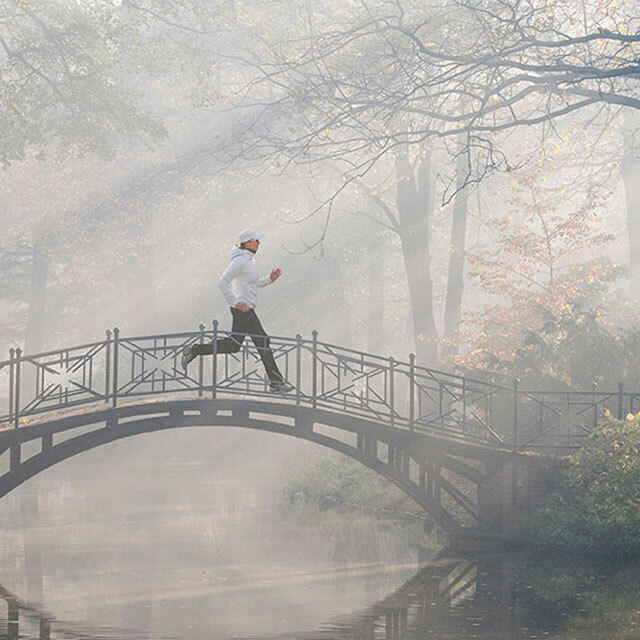 Perfect for all weather running. 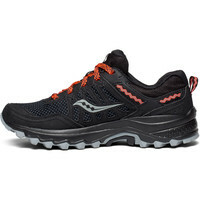 Cheaper than the others, the Saucony Excursion has Grid cushioning, a trail specific outsole and a Goretex upper to keep your feet dry in rain and waterlogged ground. A 5mm tread and Contragrip rubber to grip the ground whether it's wet or dry. 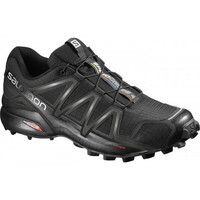 More spacious in the forefoot than some other Salomon shoe to fit wider feet more comfortably. A reinforced toe guard protects your toes from getting bumped on uneven surfaces. 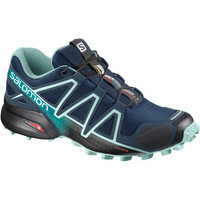 Salomon Trailster is a good trail shoe at the cheaper end of the market. 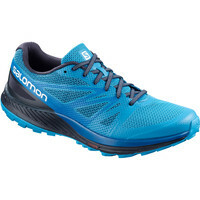 All the comfort and cushioning of a road running shoe but with a grippy 4mm lugged outsole to prevent you slipping when it's sloppy underfoot. 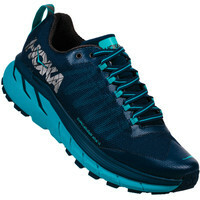 The Wet traction Contragrip outsole material offers good purchase on wet roads or rocks. 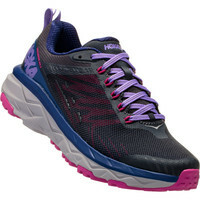 Vibe technology in the heel absorbs vibrations for a smooth, protected ride. 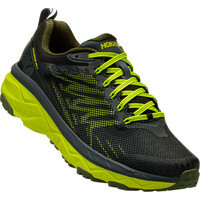 Sense Escape is a high quality technical trail running shoe at a reasonable price. 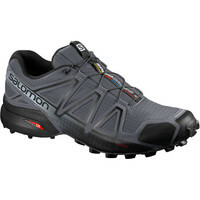 Specifically designed to accommodate a wide or high volume foot, Salomon's wide fitting Speedcross is a long-trusted technical trail shoe with plenty of off road features. 6mm deep chevron shaped lugs bite into soggy trails to offer superb traction and wet grip rubber reduces the chances that you'll lose your footing on wet road or rock. 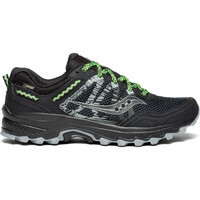 Tough uppers and a strong Quicklacing system is designed to stand up to even the most rugged terrain. 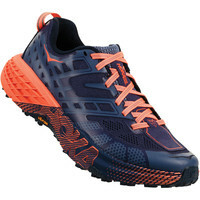 Made for running on mixed terrain. 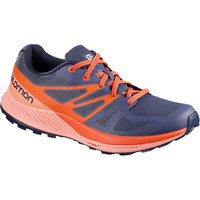 Good grip for the soft stuff yet the outsole is not too ridged so you can use it on harder, flatter ground (like pavements) as well. 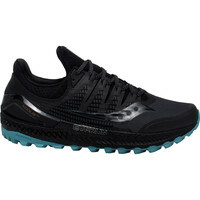 Plenty of shock absorption. 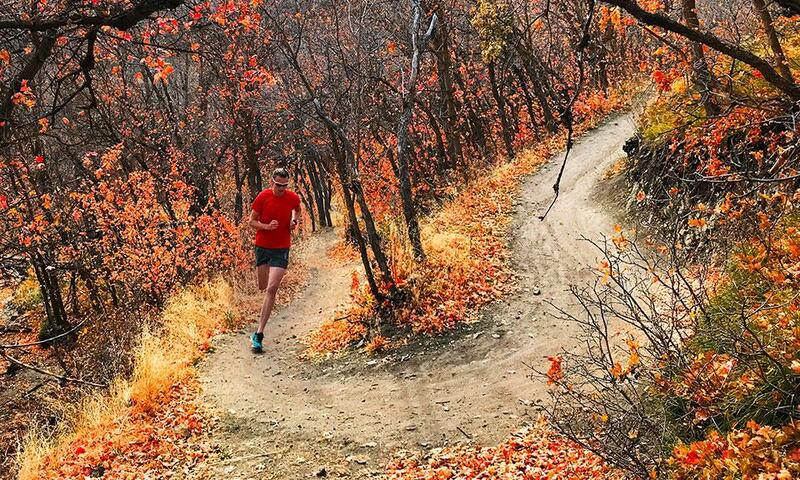 With the right trail running shoes you’re equipped for anything the weather might throw at us this winter. Enjoy getting off the pavements and discovering the countryside.